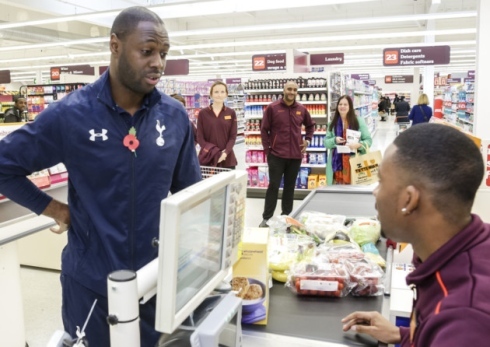 Former England football player and Tottenham Hotspur Ambassador Ledley King (main picture) is backing the launch of a local jobs pilot aimed at getting more young people from black and ethnic minorities into work. A new ‘Job Fit’ pilot launched recently by Work and Pensions Secretary Iain Duncan Smith has been developed from survey results showing young people wanted more mentoring and work experience opportunities. The Government says the pilots have been developed to provide additional support than that already offered through the Work Programme and the Flexible Support Fund, and are aimed to tackle local and entrenched barriers preventing young black and ethnic minorities from moving off benefits and into work. It believes that working together with business to create jobs and get people into work are central to the Tory-led Government’s long-term economic plan to build a stronger, more competitive economy, so young people can secure their future. According to the Government, there are now more than 3 million ethnic minority workers in jobs in Great Britain. Ten years ago, the employment rate gap between ethnic minorities and the overall population was 15.2 percentage points, that now stands at 11.8 percentage points. However young black men, for example, are still more likely to be unemployed (24 per cent of all young black men, compared with 15 per cent of all young men), which is why Jobcentre Plus (JCP) have developed a locally-tailored approach to tackle the issue. Mr Smith said: “All young people should grow up believing that they will have the opportunity to have a fulfilling career. "Government's role is to ensure they have the skills and the support they need to fulfil their aspirations. But businesses have a valuable role to play too - by opening their doors and giving young people a chance. "Over the past decade the employment gap has narrowed, but we know more needs to be done. But the opposition Labour Party points out Mr Smith and the Tory-led Government’s policies are pushing youth unemployment to record highs. Liam Byrne, Labour's Shadow Work and Pensions Secretary commenting ahead of new unemployment statistics argues that Labour Party's legacy was falling youth unemployment and a pioneering programme to get 200,000 young people back to work. “The Tories scrapped that programme and now youth unemployment has escalated to a record high,” he said. "The Tory-led Government has got to get a grip and fast. Our young people now face a summer of anxiety. If they don't get the grades to go to college they face a jobs market that tougher than ever." Tottenham Hotspur Football Club is already working in partnership with Jobcentre Plus, Haringey Council and Sainsbury’s on an employment partnership for all local people. They will carry out a programme of intervention and support to put local people in the best possible position to get access to the jobs and training opportunities that are starting to emerge from the Club’s new stadium scheme, the first step in the regeneration of Tottenham. Through its award-winning Foundation, the Club is supporting this latest pilot in Haringey through innovative community development programmes such as E18HTEEN and OnSide, that use the unique appeal of Premier League football to create life-changing opportunities. Tottenham Hotspur Football club are partnering with Tottenham JCP as one of four pilots being run with local employers across London over the next 6 months. Other pilots are being run in Lambeth, Brent and Hackney, where the results will be tracked and compared with a comparison group, and best practice will be used in jobcentres in other parts of the country. Employers interested in supporting local young unemployed people get into work can join the pilots by contacting the Tottenham, Brent, Lambeth and Hackney Job Centre Plus.